Fireproofing Service - Removable and Reusable Insulation - Thermohelp Inc.
We have experience with all three types of fireproofing. The most cost effective fireproofing strategy is to install removable fireproofing covers. With removable fireproofing covers, there is no need to prepare (sandblast and primer) the metal surface, unlike fireproofing coatings, and is removable for inspection, unlike fireproofing cement which needs to be completely removed to inspect the underlying surface, while keeping an equivalent RV factor (time in direct flame) and shortening the installation time. 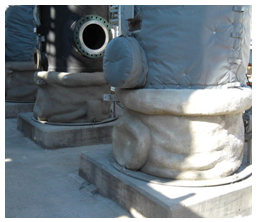 Removable fireproofing covers are similar to our removable thermal insulation covers. Fireproofing covers are made from 2-3” thick fire retarded materials. These fireproofing materials can withstand 2-2.5 hrs of exposure to direct flame. Our fireproofing insulation is specially designed to handle the high temperature of hydrocarbon combustion.